Arrange asparagus in single layer on the right side of a baking sheet. Add 2 teaspoons chopped garlic cloves and salt/pepper, to taste. Toss to combine. Place 4 pieces of butter on top of asparagus. Bake for 4-6 minutes. While asparagus are roasting add shrimp, chopped garlic, parsley, paprika, and red pepper flakes to gallon ziplock bag. Shake until combined and shrimp are coated with spices. Remove asparagus from oven. Dump shrimp from gallon ziplock bag onto left side of pan. Place 8 slices of butter over shrimp. Salt/pepper, to taste. Bake shrimp and asparagus for 6-8 minutes, or until shrimp are opaque and fully cooked and asparagus is soft yet crisp. Remove pan from oven. Add 1 Tablespoon of lemon juice to shrimp. Toss to combine. Add 1 teaspoon lemon juice to asparagus. Toss to combine. Add s & p, to taste. 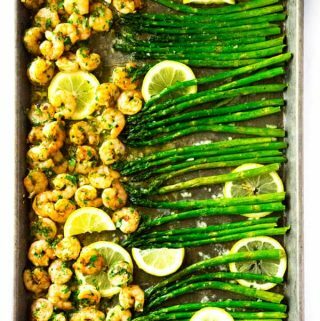 Serve shrimp and asparagus with lemon wedges, if desired.